Though digital photography (whether on fancy DSLRs or iPhones with portrait mode) is inarguably king today, there are still people out there shooting film. Though not quite a relic yet, the chemical-laden process of developing and printing your own film in a darkroom is something many people may not understand or even be aware of. One of the key components of doing this is laying the soon-to-be photograph in a tray filled with developer chemicals, which steadily brings the photo to life. Artist John Cyr, a photographer and printer himself, has latched onto the developer tray as an integral object to the working photographer. 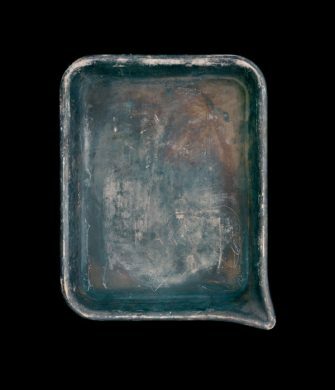 His images, portraying developer trays that belonged to notable and unknown photographers alike, cast these practical objects in a light usually reserved for more “important”-seeming items. Their unique textures, stains, colors, and designs documented for posterity illuminate film development as a historically-significant art practice in itself. Opening Thursday, March 29 at American Medium, 6 pm to 9 pm. On view through April 28. “Contrary to logic, it has been proven that a caricature of a familiar face is more easily recognized than a realistic drawing of the same face.” So states the exhibition statement for the tongue-twisting group show You Are Who You Think I Think You Are, which focuses on stylized, cartoonish portrayals of “notions of self.” Unlike self-portraits, which carry the expectation of some degree of visual recognizability, bringing the self into an otherworldly land that can actually be more relatable than that of realism. 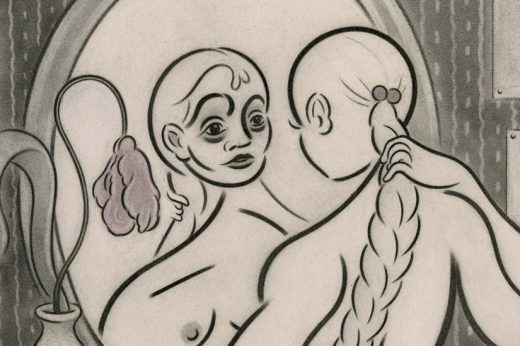 Distorted bodies, vintage illustration styles, and fantastical beings abound, and you may find yourself wondering what was going through these artists’s minds when choosing to see themselves this way. Opening Saturday, March 31 at Selena Gallery, 7 pm to 10 pm. On view through April 29. While John Cyr’s show at Elizabeth Houston Gallery showcases photos of photo developing tools, Poet and artist Seldon Yuan’s new exhibition at Bushwick’s Selena Gallery displays only what his mind can recall. 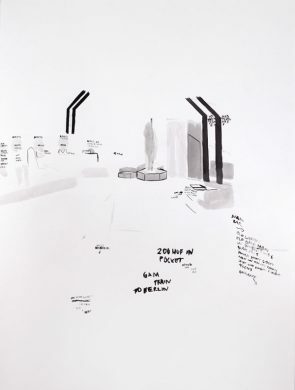 The appropriately-titled No Photos is a show of drawings from times the artist was not permitted to photograph his surroundings, or times he just simply did not think to press the shutter. The result is an intimate look into the artist’s mind; rather than merely trying to realistically recreate the imagery he did not photograph, he instead combines his notes with a stylized sketch of his surroundings, creating artwork that almost feels voyeuristic to take in, like those times you’ve probably furtively tried to read the text messages of the person sitting next to you on the train.